While police were dealing with a 24-year-old man for traffic offences they discovered he had cannabis in his possession. David Strickland, whose address was given as Pollock Drive, Lurgan, was fined £200 last Wednesday at Craigavon Magistrates Court for unlawful possession of cannabis on June 9 this year. He was also fined £75 and ordered to pay a £15 offender’s levy for not having a vehicle test certificate. Strickland was also fined £75, and given three points, for having a defective tyre on his vehicle. 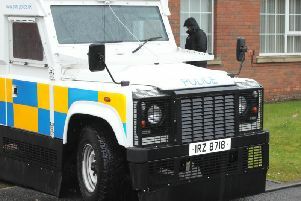 The court was told how the defendant was stopped by police while he was riding a moped at Shimna Walk in Lurgan. There was no test certificate in place and there was no tread on one of the tyres, the court heard. Police found that Strickland was also was in possession of a small amount of cannabis resin at the time he was stopped. A solicitor representing Strickland said his client lived a solitary lifestyle and the cannabis was for his own use.